While your replication instance is being created, you can specify the Oracle source endpoint using the AWS Management Console. However, you can only test connectivity after the replication instance has been created, because the replication instance is used to test the connection. In the AWS DMS console, choose Endpoints on the navigation pane. Choose Create endpoint. The Create database endpoint page appears, as shown following. Specify your connection information for the source Oracle database. The following table describes the source settings. 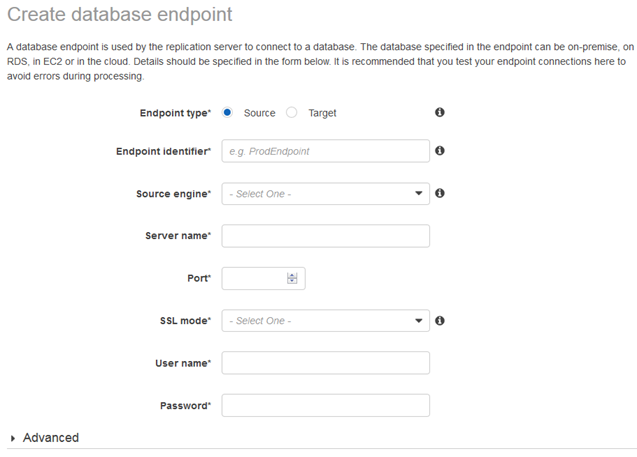 Type an identifier for your Oracle endpoint. The identifier for your endpoint must be unique within an AWS Region. If your database is on-premises, type an IP address that AWS DMS can use to connect to your database from the replication server. If your database is running on Amazon Elastic Compute Cloud (Amazon EC2) or Amazon RDS, type the public Domain Name Service (DNS) address. Type the port which your database is listening for connections (the Oracle default is 1521). Choose a Secure Sockets Layer (SSL) mode if you want to enable connection encryption for this endpoint. Depending on the mode you select, you might need to provide certificate and server certificate information. Type the AWS account user name. We recommend that you create an AWS account specific to your migration. Provide the password for the user name preceding. Choose the Advanced tab to set values for extra connection strings and the encryption key. Here you can add values for extra attributes that control the behavior of your endpoint. A few of the most relevant attributes are listed here. For the full list, see the documentation. Separate multiple entries from each other by using a semi-colon (;). addSupplementalLogging: AWS DMS will automatically add supplemental logging if you enable this option (addSupplementalLogging=Y). useLogminerReader: By default AWS DMS uses Oracle LogMiner to capture change data from the logs. AWS DMS can also parse the logs using its proprietary technology. If you use Oracle 12c and need to capture changes to tables that include LOBS, set this to No (useLogminerReader=N). numberDataTypeScale: Oracle supports a NUMBER data type that has no precision or scale. By default, NUMBER is converted to a number with a precision of 38 and scale of 10, number(38,10). Valid values are 0—38 or -1 for FLOAT. archivedLogDestId: This option specifies the destination of the archived redo logs. The value should be the same as the DEST_ID number in the $archived_log table. When working with multiple log destinations (DEST_ID), we recommend that you specify a location identifier for archived redo logs. Doing so improves performance by ensuring that the correct logs are accessed from the outset. The default value for this option is 0. Choose the encryption key to use to encrypt replication storage and connection information. If you choose (Default) aws/dms, the default AWS KMS key associated with your account and region is used.